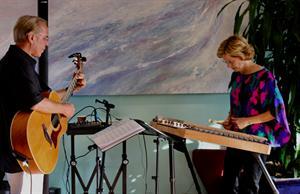 Many-Strings is the musical collaboration of Jamie on hammered dulcimer and Chris on guitar. Their instrumental music is a delightful mix of Renaissance, Celtic, American and classical melodies. The rich interaction between their instruments creates a sound that is simultaneously upbeat and melodic. Jamie is inspired by the traditions of folk and Irish music, including Turlough O'Carolan. Chris' contributions reflect the diversity of the classical world along with his love for instrumental music. Many-Strings performs regularly at Liberty Station's Public Market, OASIS, and many other special venues. Many-Strings also provides concerts and music education experiences for libraries, The San Diego History Center, and other community based venues. In planning for your event we can create customized sets of music that feature American, Irish, Celtic, and classical selections. The Roots of American Folk Music: Renaissance, Bach, English, Irish melodies, concluding with traditional and contemporary American folk tunes. Water Music: Music from the sea, lakes, rivers, and the journey to America. December Notes: Seasonal winter, Christmas, and other holiday-themed melodies. Notes for an Exhibition: A delightful selection of music that features the beauty of the hammered dulcimer and guitar. Romantic Melodies from the Classical World and Ireland: A wonderful sequence that includes Renaissance melodies, Bach, Beethoven, The New World Symphony, and much more. Songs and Ballads from Shannon's Pub: Great tunes from the Irish public house. Paddy Works on the Railway, The Rose of Tralee, and much more! 1-3 hours of Irish and Scottish ballads, etc. We encourage you to contact us for any event where beautiful music is desired. 1. Concerts: Mission Hills Library, Mission Trails Regional Park, OASIS, The Serra/Presidio, San Diego History Center, The Point Loma Library, The Rancho Bernardo Library, White Sands, Chateau La Jolla, City of Santee, Belmont Village: Sabre Springs, Mt. Miguel Covenant Village, and many other venues. 2. Music for Art Galleries and Special Events: The San Diego International Airport, Terminal 2 Arts Venue, Art on Adams, Dan McGeorge Gallery, The Inn at La Jolla, Scripps Health and Scripps Mercy special events, ArtWalk, The Big Sur Coast Gallery, and many other venues. 3. Music for Retail, Wine, etc: 1906 Lodge Coronado, The Public Market at Liberty Station, Kensington VitaJuice Cafe, Zilaro Cellars, Big Sur Lodge, The Upper Crust Bakery/ Cafe, Organic People's Market, and many other fine venues. 4. Music for Well-being and Health: The Braille Institute, University Christian Church, First United Methodist Church, Scripps La Jolla, Mercy Hospital, Scripps Chula Vista, Prebys Cardio Vascular Institute, and many other similar venues. May 5: Many-Strings performs for the First United Methodist Church's Recognition and Celebration of Life. Private. May 13: Lisdoonvarna at Hooleys Irish Public House, 11:30am-1pm. Traditional Irish and Celtic Folk Music. May 24: Many-Strings at Casa de las Companas, private. May 28: Many-Strings performs "The Maritime Set" on The Star of India, 10am-11am. May 31: Many-Strings performs "The Roots of American Folk Music" at Temple Emanu-El, public welcome. 12:30pm to 1:30pm. April 1: OASIS Beatle Slow Jam, 9:30-10:30am at the Grossmont Center Wellness Center. April 8: OASIS Beatle Slow Jam, 9:30-10:30am, at the Grossmont Center Wellness Center. April 8: Lisdoonvarna at Hooleys Irish Public House, 11:30am-1pm. Traditional Irish and Celtic Folk Music. April 9: Music Appreciation: Mozart, The Boy Wonder and His Concertos, La Jolla Community Center, 2-3pm. April 15: OASIS Beatle Slow Jam at 9:30-10:30am at the Grossmont Center Wellness Center. April 16: Lisdoonvarna at the Maritime on the HMS Surprise, 9:30 am to 11ish. April 19: Live Show: The Music of Molly's Old Town Tavern, The Braille Institute, La Jolla, open to the public. 10:30-11:30 am. April 22: OASIS Beatle Slow Jam at 9:30-10:30am at the Grossmont Center Wellness Center. April 24: Live Show: Music of Molly's Old Town Tavern, OASIS Grossmont Center Learning Center, 11am-12noon. April 26: Live Show: Music of Molly's Old Town Tavern, Casa de las Companas, private. March 4: OASIS Celtic Slow Jam at 9:30am at the Grossmont Center Wellness Center. March 4: Lisdoonvarna at Hooleys Irish Public House, 11:30am- 1pm. March 11: OASIS Celtic Slow Jam at 9:30am at the Grossmont Center Wellness Center. March 11: Many-Strings "Celtic Notes" concert, Hooleys Public House, Grossmont Center, 12noon, an OASIS music event. March 12: The Magnificent Diversity of Celtic Music: Music Appreciation at OASIS, 1pm, Grossmont Center Lecture Hall. March 12: The Magnificent Diversity of Celtic Music: Music Appreciation, La Jolla Community Center, 3:30 pm. March 15: Many-Strings at the Liberty Station Public Market, 11am-1pm. March 18: OASIS Celtic Slow Jam at 9:30am at the Grossmont Center Wellness Center. March 22: "Celtic Songs and Ballads": at Casa de las Companas, private. March 29: Many-Strings at the Liberty Station Public Market, 11am-1pm. Feb. 4: OASIS Celtic Slow Jam at 9:30am at the Grossmont Center Wellness Center. Feb. 4: Lisdoonvarna at Hooleys Irish Public House, 11:30am- 1pm. Feb. 7: Many-Strings at the Liberty Station Public Market, 11am-1pm. Feb. 11: OASIS Celtic Slow Jam at 9:30am at the Grossmont Center Wellness Center. Feb. 12: Vivaldi's The Four Seasons, La Jolla Community Center, 2pm. Feb. 14: Music of your Heart: The Beatles, Grossmont OASIS Lecture Hall, Grossmont Mall at 1pm. Feb. 20: Many-Strings at the Liberty Station Public Market, 11am-1pm. Feb. 21: Many-Strings: The Music of the Presidents, Grossmont OASIS Lecture Hall, Grossmont Mall at 11am. Feb. 22: Many-Strings at Casa de las Companas, private. Feb. 25: OASIS Celtic Slow Jam at 9:30am at the Grossmont Center Wellness Center. Jan. 7: Lisdoonvarna at Hooleys Irish Public House, 11:30am- 1pm. Jan. 8: Music Appreciation: Renaissance Music for a New Year: La Jolla Community Center, 2pm. Jan. 26: Music Appreciation: Animals in Classical and Folk Music, 4S Library, 12 noon, a free OASIS event! Jan. 27: The NAMM Show: Thank you Dusty Strings! Jan. 30: Music Appreciation: The Evolution of Rock n'Roll, Grossmont OASIS Lecture Hall, Grossmont Mall at 11 am. Dec. 3: Holiday Slow Jam: at Grossmont OASIS Wellness Center, 9:30 am. Dec. 6: Many-Strings "A Renaissance Christmas" OASIS Concert Hall, 11am. Dec. 10: Holiday Slow Jam: at Grossmont OASIS Wellness Center, 9:30 am. Dec. 10: Lisdoonvarna at Hooleys Irish Public House, 11:30am- 1pm. Dec. 11: The Gorgeous Music of Tchaikovsky, private (Belmont Village, Sabre Springs. Dec. 13: Many-Strings: A Holiday Sing A-long, Canyon Villas, private. Dec. 13: Many-Strings: A Holiday Sing A-long, Escondido Library, 1pm. Dec. 15: Many-Strings "A Renaissance Christmas" at Mount Miguel Covenant Village, private. Dec. 18: The Wonderful Music of Handel, at Mount Miguel Covenant Village, private. Dec. 21: Many-Strings "A Renaissance Christmas" for the Rancho Bernardo Womans Club. Dec. 28:Many-Strings "A Renaissance Christmas" at Casa de las Companas, private. Nov. 5: Holiday Slow Jam: at Grossmont OASIS Wellness Center, 9:30 am. Nov. 5: Lisdoonvarna at Hooleys, Irish Folk Music, 11:30 am - 1pm. Nov. 6: The Evolution of American Folk Music: From the Colonies to the Beatnik Coffee House, OASIS Learning Center Lecture Hall, 1 pm. Nov. 9: The Music of Tchaikovsky, an OASIS event, at the Braille Institute, La Jolla. Open to the general public. 10:30 am. Nov. 10: Music Honoring our Veterans, a live music event, Santee Library at 1pm. Free thanks to the Friends of the Santee Library. Nov. 10: Music Honoring our Veterans, a live music event, Alpine Library at 3:30 pm. Free thanks to the Friends of the Alpine Library. Nov. 11: Music Honoring our Veterans, a live music event, Belmont Village, Sabre Springs. private event. Nov. 11: Music Honoring our Veterans, a live music event. Mount Miguel Covenant Village, Assisted Living. private event. Nov. 11: Music Honoring our Veterans, a live music event. Health Care. Mount Miguel Covenant Village. private event. Nov. 13: The Music of George Frederick Handel, Belmont Village, Sabre Springs, private event. Nov. 16: Thanksgiving Notes by Many-Strings, Mount Miguel Covenant Village. private event. Nov. 17: Thanksgiving Notes by Many-Strings, The Cloisters. Private event. Nov. 19: Holiday Slow Jam: at Grossmont OASIS Wellness Center, 9:30 am. Nov. 20: Thanksgiving Notes concert by Many-Strings, at OASIS Grossmont Learning Center/ Concert Hall, 11 am. Nov. 21: Many-Strings at the Liberty Station Public Market, 11am-1pm. Nov. 22: Thanksgiving Notes by Many-Strings, Belmont Village Sabre Springs. Nov. 22: Thanksgiving Notes by Many-Strings, St. Paul's Retirement Community. Nov. 23: Thanksgiving Notes by Many-Strings, Casa de las Companas, private. Nov. 26: Holiday Slow Jam: at Grossmont OASIS Wellness Center, 9:30 am. Nov. 28: Thanksgiving Notes by Many-Strings, Canyon Villas Retirement. Nov. 30: Many-Strings at the Liberty Station Public Market, 11am-1pm. Oct. 1: Beatles Slow-Jam at Grossmont OASIS Wellness Center, 9:30 am. Oct. 8: Beatles Slow-Jam at Grossmont OASIS Wellness Center, 9:30 am. Oct. 15: Beatles Slow-Jam at Grossmont OASIS Wellness Center, 9:30 am. Oct. 22: Beatles Slow-Jam at Grossmont OASIS Wellness Center, 9:30 am. Oct. 26: San Diego History Through Music (live show), Santee Library, 10 am. Sept. 5: "600 Years of Music in 60 Minutes," Santee Library at 9am. Sept. 11: Orchestral Music for the Movies, Sabre Springs Belmont Village, private event. Sept. 11: Gershwin and Grofe: The Ultimate Collaboration, La Jolla Community Center at 3pm. Sept. 17: Beatles Slow-Jam at Grossmont OASIS Wellness Center, 9:30 am. Sept. 24: Beatles Slow-Jam at Grossmont OASIS Wellness Center, 9:30 am. Sept. 28: "The Evolution of American Folk Music" at the Braille Institute (open to all) at 10:30 am. Sept. 28: Many-Strings at Casa de las Companas, (Maggie's Old Time Tavern Music) private. Aug. 6: OASIS Slow Jam; Songs from the Sea and the West, 2:30, Grossmont Center. Aug. 13: OASIS Slow Jam; Songs from the Sea and the West, 2:30, Grossmont Center. Aug. 21: Tchaikovsky's 1812 Overture: Music and History, at Grossmont Center OASIS Lecture Hall, 10 am. Aug. 24: Many-Strings performs The Roots of American Folk Music, at Casa de las Companas, private. July 2: OASIS Slow Jam; Songs from the Sea and the West, 2:30, Grossmont Center. July 2: Lisdoonvarna (Chris, Natasha, and Jack) at Hooley's Irish Pub, Grossmont Center, 4pm. July 3: Live History-Music Concert: Music for the 4th of July, Grossmont OASIS Concert Hall, 11am-12noon. Free hot dogs will be served! July 3: Live History-Music Concert: Music for the 4th of July, CA Center of the Arts Studios. An OASIS North County Event, 1-2pm. July 3: Live History-Music Concert: Music for the 4th of July, Rancho Bernardo Library, 5 pm. A free event thanks to the "Friends of the Library." July 5: Many-Strings performs at the Liberty Station Public Market, 11 am to 1pm. July 6: Live Music Event Celebrating Freedom and Independence, Mt. Miguel Covenant Village, private. July 8: Live Music Event Celebrating Freedom and Independence, Belmont Village, private. July 9: OASIS Slow Jam; Songs from the Sea and the West, 2:30, Grossmont Center. July 11: Live Music Event: The History of San Diego Through Music, at 10:30 at the Aqua Hedionda Lagoon Nature Center, Carlsbad, an OASIS event. July 12: Live Music Event Celebrating Freedom and Independence, Canyon Village, private. July 13: Live Music Event Celebrating Freedom and Independence, Mt. Miguel Cov. Village, private. July 14: Many-Strings performs "The Roots of American Folk Music" at the Hillcrest Library, at 3pm. A free event thanks to the "Friends of the Library." July 16: Live Music Event: The History of San Diego Through Music, at the OASIS Concert Hall, at 10am. Birthday cake will be served! July 16: OASIS Slow Jam; Songs from the Sea and the West, 2:30, Grossmont Center. July 17: The Evolution of American Folk Music, Belmont Village, private. July 19: Many-Strings performs at the Liberty Station Public Market, 11 am to 1pm. July 20: Many-Strings performs: "Water Music" at the OASIS Concert Hall, at 11am. July 26: The Evolution of American Folk Music, St. Paul's Village, private. July 27: Many-Strings: A Treasure Chest of Songs, at Casa de las Companas, private. July 29: Live Music Event Celebrating Freedom and Independence, The Cloisters, private. July 30: OASIS Slow Jam; Songs from the Sea and the West, 2:30, Grossmont Center. June 2: Many-Strings performs at the Liberty Station Public Market, 11 am to 1 pm. June 3: Many-Strings performs the Celtic Set at Mission Tails Regional Park Concert Hall, 3pm. June 4: Reading the Treble Clef: an OASIS class, Grossmont Center, 2:30 pm..
June 4: Lisdoonvarna (Chris, Natasha, and Jack) at Hooley's Irish Pub, Grossmont Center, 4pm. June 9: The Music of Aaron Copland, Santee Library at 1pm. June 11: Reading the Treble Clef: an OASIS class, Grossmont Center, 2:30 pm. June 12: The Music of J. S. Bach and his life, Belmont Village Sabre Springs, private. June 12: Orchestral Music for the Movies: La Jolla Community Center, 3pm. June 14: Many-Strings: A Treasure Chest of Songs, Canyon Villas, private. June 15: Many-Strings performs at the Liberty Station Public Market, 11 am to 1 pm. June 17: Many-Strings: A Treasure Chest of Songs, The Cloisters, private. June 18: Reading the Treble Clef: an OASIS class, Grossmont Center, 2:30 pm. June 21: Many-Strings participates in "Fete de la Musique" on Shelter Island. June 22: Many-Strings: A Treasure Chest of Songs, at Casa de las Companas, private. June 25: OASIS Slow Jam; Songs from the Sea and the West, 2:30, Grossmont Center. May 2nd: Many-Strings performs at the Liberty Station Public Market, 11 am to 1 pm. May 3rd: Celtic Music Show, Private SMCV. May 6th: Many-Strings performs for the First United Methodist Church's Recognition and Celebration of Life. Private. May 7th: Lisdoonvarna (OASIS Celtic Slow Jam Group) performs at Hooleys, Grossmont Center Mall, 4pm-5pm. May 8th:The Music of Beethoven and His Time. Belmont Village, Sabre Springs, Private. May 8th: 600 Years of Music in 60 Minutes, La Jolla Community Center, at 3pm. May 10th: Many-Strings performs "Water Music" for Canyon Villas Retirement Community. Private. May 11th: The Music of Grofe and Gershwin: The Ultimate Collaboration, at the Santee Library, at 10 am. A free event thanks to "The Friends of the Library." May 12th: Many-Strings at the Liberty Station Public Market, 11 am to 1 pm. May 20th: Many-Strings performs "Water Music" for The Cloisters. Private. May 21: Reading the Treble Clef: an OASIS class, Grossmont Center, 2:30 pm. May 22: Many-Strings performs "The Roots of American Folk Music" at the Skyline Library, 6:30 pm. A free event thanks to "The Friends of the Library." May 24: The Music and Times of J.S. Bach, St. Paul's Retirement Community, private. May 25: Many-Strings performs "Water Music" for Casa de las Companas, private. May 28th: Many-Strings performs for the Little Italy Association in their new Piazza della Famiglia square, Little Italy, 11am-1pm. April 2: OASIS Celtic Group at Hooleys Public House, Grossmont, 4-5pm. April 3: Celtic Irish Sing A-Long Ballad Concert, Canyon Villas, Private. April 4: Jazz: Exceptional Creativity, Santee Library, a free music show thanks to The Friends of the Library. April 5: The Music and Life of Beethoven, St. Paul's Retirement Community, Private. April 6, Music and Meditation at the Ramona Library, at 1pm, a free event thanks to the OASIS and The Friends of the Library. April 7: Many-Strings at Point Loma's Public Market/ Liberty Station, 11am-1pm. April 8: Celtic Irish Sing A-Long Ballad Concert, The Cloisters, Private. April 9: Beginning Guitar and more: at 2:30 at the Grossmont Center Wellness Center. April 10: The Music of Smetana, at Belmont Village, private. April 12: Many-Strings performs "Celtic Notes" at the OASIS Grossmont concert hall, at 1 pm. April 14: Many-Strings at Point Loma's Public Market/ Liberty Station, 11am-1pm. April 16: Beginning Guitar and more: at 2:30 at the Grossmont Center Wellness Center. April 17: Many-Strings performs "Celtic Notes" at The Arbors, private. April 18: The Music of Johann Sebastian Bach, OASIS Grossmont Lecture Hall, at 10 am. April 19: The History of Jazz, at the La Jolla Community Center, at 3pm. April 27: Celtic Irish Sing A-Long Ballad Concert, at Casa de las Companas, private. April 30: Many-Strings performs "Water Music" for Aqua Hedionda Lagoon Nature Center, Carlsbad, at 2:30 pm, an OASIS event. March 5: OASIS Celtic Slow Jam at 2:30 at the Grossmont Center Wellness Center, 2:30. March 7: Songs of the Wild West, Railroads and Cowboys, San Marcos Historical Soc. 11 am. March 8: Celtic Music: Diversity and Creativity, OASIS Learning Center, Grossmont Mall, 10 am. March 12: Beginning Guitar and more: at 2:30 at the Grossmont Center Wellness Center. March 14: Celtic Irish Sing A-Long Ballad Concert: OASIS Learning Center, Grossmont Mall, 1 pm. March 15: Many-Strings Celtic Notes Concert at The Escondido Center for the Performing Arts, 11 am. An OASIS Event open to the public. March 15: Many-Strings Celtic Notes Concert, Casa de las Campinas, Rancho Bernardo. March 19: Beginning Guitar and more: at 2:30 at the Grossmont Center Wellness Center. March 26: Beginning Guitar and more: at 2:30 at the Grossmont Center Wellness Center. March 26: OASIS Celtic Group at Hooleys Public House, Grossmont, 4-5pm. Feb. 5: OASIS Celtic Slow Jam at 2:30 at the Grossmont Center Wellness Center, 2:30. Feb. 6: Many-Strings in Concert, Roots of American Folk Music, Julian Library at 6pm. Feb. 7: The Music of Mozart, his life and Constanze, OASIS Learning Center at 10am. Feb. 14: Jazz: Exceptional Creativity at OASIS, 1pm. Learning Center. Feb. 15: The Music of Presidents Washington and Lincoln, at the San Marcos Historical Society, 11 am. Feb. 19: The Music of Presidents Washington and Lincoln, Belmont Village, Sabre Springs. Feb. 20: The Music of Presidents Washington and Lincoln, Canyon Villas Retirement. Feb. 23: The Music of Presidents Washington and Lincoln, Casa de las Campinas, Rancho Bernardo. Feb. 25: The Roots of American Folk Music, Private, White Sands, La Jolla. Feb. 26: OASIS Celtic Slow Jam at 2:30 at the Grossmont Center Wellness Center, 2:30. Jan. 15: "The Music of Holst: The Planets" an OASIS program at the Aqua Hedionda Lagoon Nature Center, Carlsbad, at 2pm. Dec. 1: Many-Strings at the Point Loma Liberty Station Market, 11am-1pm. Dec. 5: Many-Strings at the Point Loma Liberty Station Market, 11am-1pm. Dec. 11: 600 Years of Music in 60 Minutes, at the Serra Library, free thanks to the Friends of the Library. Dec. 13: Holiday Sing A-Long at the San Marcos Library, free thanks to the Friends of the Library, 1pm. 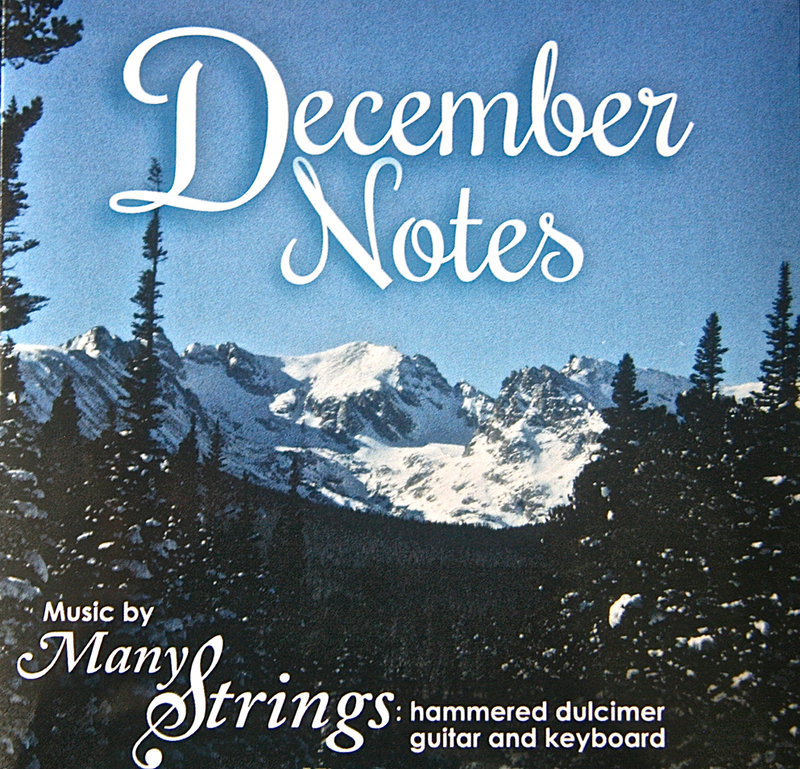 Dec. 17: Many-Strings performs "December Notes" at Mission Trails Park, 3 pm. Dec. 18: "December Notes" concert at Casa de las Campinas, Rancho Bernardo, 2pm. Dec. 19: "December Notes" concert at St. Paul's Manor, 2pm. Nov. 6: Thanksgiving Notes Concert: Canyon Villas Retirement. Nov. 6: OASIS Slow Jam: Grossmont Center Wellness Center: 12:45. Nov. 8: The Music of Grofe and Gershwin at OASIS Grossmont Center, 10:30 am. Nov. 10: Thanksgiving Notes Concert: St. Paul Manor/Senior Center. Nov. 14: Many-Strings Concert, "The Roots of American Folk Music" at the North Clairmont Library at 6:30 pm. Nov. 16: Orchestral Music of the Movies, Coronado Library, 6 pm. Nov. 18: Thanksgiving Notes Concert at Mt. Miguel Covenant Village. Nov. 18: Thanksgiving Notes Concert at Belmont Village, Sabre Springs. Nov. 19: Many-Strings Performs: University Christian Church, Simple Gifts, etc. Nov. 20: OASIS Holiday Slow Jam, 12:45, at the Grossmont Wellness Center. Nov. 25: Many-Strings at the Point Loma Liberty Station Market, 11am-1pm. Nov. 27: OASIS Holiday Slow Jam, 12:45, at the Grossmont Wellness Center. Nov. 28: Many-Strings at the Point Loma Liberty Station Market, 11am-1pm. Nov. 29: Thanksgiving Notes Concert at Casa Loma, La Jolla. Nov. 30: Thanksgiving Notes Concert at Mt. Miguel Covenant Village Health Center. Oct. 6: Music and Meditation: OASIS Grossmont Center, 1:30. Oct. 10: Classical Music: The Evolution of Western Music, Belmont Village, Sabre Springs. Oct. 11: Jazz: Exceptional American Creativity, Belmont Village Cardiff. Oct. 14: Many-Strings at Point Loma's Public Market, Liberty Station, 11am to 1 p.m.
Oct. 16: OASIS Slow Jam, OASIS Grossmont Wellness Center, 12:45pm. Oct. 19: Music for October! Private Show at Belmont Village, Sabre Springs. Oct. 20: Music and Meditation: OASIS Grossmont Center, 1:30. Oct. 21: Many-Strings at Point Loma's Public Market, Liberty Station, 11am to 1 p.m.
Oct. 23: OASIS Slow Jam, OASIS Grossmont Wellness Center, 12:45pm. Oct. 27: Music and Meditation: OASIS Grossmont Center, 1:30. Oct. 30: OASIS Slow Jam, OASIS Grossmont Wellness Center, 12:45pm. Oct. 31: Music for October! Private Show at The North Clairmont Library, an OASIS event that is free with the generosity of the local Friends of the Library. Sept. 2: Many-Strings at Point Loma's Public Market, Liberty Station, 11am to 1 p.m.
Sept. 4: The Music of the Wild West, Private Event at Mt. Miguel Covenant Village. Sept. 9: Many-Strings at Point Loma's Public Market, Liberty Station, 11am - 1 pm. Sept. 12: Classical Music: Pictures at an Exhibition by Mussorgsky, Sabre Springs Belmont Village. Aug. 4: "The Music of John Williams" at the Ramona Library at 1pm. Aug. 13: Many-Strings "Notes at an Exhibition: concert at The Cloisters, Private Show. Aug. 16: Many-Strings performs the "Water Music" concert at Cypress Court, at 3pm. Aug. 19: Many-Strings at the Liberty Station Public Market, 11am-1pm. Aug. 25: "Orchestral Music from the Movies" at the Santee Library at 10am. Aug. 28: The OASIS Slow Jam at the Grossmont Campus, 12:45. Aug. 29: Many-Strings at Las Campanas for the "Water Music" concert, Private. July 3: OASIS Beginning Guitar and Slow Jam, Grossmont Wellness Center, 12:45. July 6: 600 Years of Music in 60 Minutes: The Evolution of Classical Music, OASIS Grossmont Campus, 11a.m. July 10: OASIS Beginning Guitar and Slow Jam, Grossmont Wellness Center, 12:45. July 12: The Music of Tchaikovsky, Point Loma Library, at 1pm. July 15: Many-Strings at Point Loma's Public Market, 11am-1pm. July 17: OASIS Beginning Guitar and Slow Jam, Grossmont Wellness Center, 12:45. July 27: Mussorgsky's Picture at an Exhibition, OASIS Grossmont Campus, 11am. July 29: Many-Strings at Point Loma's Public Market, 11am-1pm. June 17: Many-Strings at Point Loma's Public Market, 11am-1pm. June 19: OASIS Beginning Guitar and Slow Jam, OASIS Grossmont Wellness Center, 12:45. June 23: History of California Through Music, San Diego History Center, for the School in the Park Program. June 24: Many-Strings at Point Loma's Public Market, 11am-1pm. June 28: The History of the United States Through Music, Belmont Village Cardiff. May 4: History of California Through Music, San Diego History Center, for the School in the Park Program. May 5: Many-Strings at Point Loma's Public Market,11-1pm. May 7: Many-Strings performs for United Methodist Church's special event. May 13: Many-Strings at Point Loma's Public Market, 11am to 1pm. May18: Classical Music Inspired by the Mountains, Casa de las Companas. May19: History of California Through Music, San Diego History Center, for the School in the Park Program. May 21: History of San Diego Through Music, private event at The Cloisters. April 1: Many-Strings at Pt. Loma's Public Market, 11am to 1 pm. April 3: Many-Strings at Casa de las Companies for the Celtic Folk Music Event. April 8: Many-Strings at Pt. Loma's Public Market, 11 am to 1 pm. April 11: Classical Music: Rimsky-Korsakov at Belmont Village. April 18: Many-Strings Celtic Folk Music at Canyon Villas. Mar. 4th: Many-Strings Celtic Notes at Point Loma's Public Market, 11am-1pm. Mar. 6th: The Music of John Williams, OASIS Mission Valley Campus, 1:30. Mar. 11th: Many-Strings Celtic Notes at Point Loma's Public Market, 11am-1pm. Mar. 16th: Celtic Folk Music following the above event. Mar. 19th: Many-Strings Celtic Notes Concert at Belmont Village, 2pm. Feb. 10: Private Show: Love and Life in Folk Music, 2pm. Feb. 12: Many-Strings at Point Loma's Public Market, 11am-1pm. Feb. 13: Private Show: Love and Life in Folk Music, 3pm. Feb. 17: Cancelled- 600 Years of Music: La Jolla Community Center, 1pm. Feb. 21: Classic Folk Songs of America, OASIS San Marcos, 10am. Feb. 21: Celtic Slow Jam, OASIS Mission Valley, 1:30 pm. Feb. 23: Orchestral Music in the Movies, OASIS Mission Valley, 1pm. Feb. 28: Celtic Slow Jam, OASIS Mission Valley, 1:30 pm. Jan. 7: Many-Strings at Point Loma's Public Market, 11am to 1 pm. Jan. 16: Many-Strings Love n Live in Folk Music, Cypress Court. Jan. 24: An OASIS Slow Jam: Celtic Music, Mission Valley Macy's Campus, 1:30pm. Jan. 31: An OASIS Slow Jam: Celtic Music, Mission Valley Macy's Campus, 1:30pm. Mar. 6: The Celtic Concert, Mission Trails Park, 3pm, Free! Mar. 10: The Celtic Slow Jam Celebration Event, Mission Valley OASIS, 1:30. April 6th: A World of Percussion Experience at OASIS, 5 pm. April 30: Many-Strings at Kensington Video for the Unplugged Festival, 12 to 2 pm. May 1: Many-Strings at Kensington VitaJuice Cafe, 1-3 pm. Unplugged Festival. May 27th: Many-Strings: the Maritime Set at Canyon Villas. May 31st: Classical Music Portraits of the Mountains, OASIS M.V., 1:30. June 2nd: Mozart, the Boy Wonder: La Jolla Community Center, 1pm. June 4th: Many-Strings at Kensington Video/VidaJuice Art-on-Adams Festival, 3-5 pm. June 14: Mozart Pt.2-The Concertos at OASIS Mission Valley, 1:30 pm. June 29: Animals in Music at OASIS Mission Valley, 10:30 am. July 3: Many-Strings at The Public Market, Liberty Station, 11am-1pm. July 25: Percussion and Folk Music Event at the Serra Mesa Library, 1:30 pm, Free! Aug. 5: Many-Strings at Liberty Station's Public Market, 11am-1pm. Aug. 12: Many-Strings at the Liberty Station Public Market, 11-1pm. Sept. 2: Many-Strings at Liberty Station's Public Market, 11am-1pm. Sept. 3: The Roots of American Folk Music Many-Strings Concert: Private Show at Mt. Miguel Village. Sept. 16: Many-Strings at the La Jolla Community Center: Roots of Am. Folk Music Concert, 1pm. Sept. 20: The Music of Aaron Copland at The La Jolla Community Center. 1pm. Sept. 26: The History of the United States Through Music, Mt Miguel Village Private Show. Oct. 7th: Many-Strings at Point Loma's Public Market, 11am-1pm. Oct. 9th: Private Show: October Music! Oct. 11th: The Music of George FredricHandel, Belmont Village. Oct. 15th: Many-Strings at Point Loma's Public Market, 11am-1pm. Oct. 18: The Music of George Fredric Handel, 1:30-2:30, at the La Jolla Community Center, an OASIS event. Oct. 19: History of San Diego Through Music, at 1:00, at the Point Loma Library, an OASIS event that is free to the public, thanks to the Friends of the Library. Oct. 20: The History of United States Through Music, at the La Jolla Community Center, 1pm. Oct. 24: The OASIS Slow Jam, bring any folk instrument, at OASIS Mission Valley, at 1:30. Oct. 31: The OASIS Slow Jam, at the OASIS Mission Valley campus, at 1:30. Nov. 2nd: The Music of Aaron Copland, Santee Library at 9 am. Nov. 4th: Many-Strings at Point Loma's Public Market, 11 am - 1 pm. Nov. 7th: The OASIS Slow Jam, at the OASIS Mission Valley campus, at 1:30. Nov. 9: Many-Strings performs "The Music of the Rivers, Lakes, and Oceans" at the La Jolla Community Center at 1pm. Nov. 10: Music, Mindfulness and Meditation, Mission Valley OASIS at 1:30.La Jolla's Mangelsen's Images of Nature Gallerygenerously contributed their catalog for use during the art-music-mindfulness part of today's event.Thank you for this generouscontribution. Nov. 14: The OASIS Slow Jam, at the OASIS Mission Valley campus, at 1:30. Nov. 16: Experiencing Music Through Percussion, at the La Jolla Community Center, at 2pm. Nov. 17: Music, Mindfulnessand Meditation, Mission Valley OASIS at 1:30. La Jolla's Mangelsen's Images of Nature Gallery generouslycontributed their catalog for use during the art-music-mindfulness part of today's event.Thank you for this generouscontribution. Nov. 21: The OASIS Slow Jam, at the OASIS Mission Valley campus, at 1:30. Nov. 22: Private Many-Strings Event. Nov. 28: The OASIS Slow Jam, at the OASIS Mission Valley campus, at 1:30. Dec. 3: Many-Strings at Pt. Loma's Public Market, 11am to 1 pm. Dec. 5: Music Genres: OASIS Mission Valley, 10:30am. Dec. 7: Many-Strings at Scripps La Jolla Trauma Reunion Celebration, Private Event. Dec. 8: Music and Meditation at La Jolla's Community Center, 1pm. Dec. 15: Many-Strings December Notes Concert, OASIS Mission Valley, 1:30. Dec. 16: Many-Strings at the Kensington VitaJuice Cafe special Holiday Public Event, 2:30-4:30. Dec. 18: Many-Strings December Notes Concert at Mission Trails Regional Park, 3pm, a free concert! Dec. 25: Many-Strings December Notes Concert, Private Event at the delightful Julian Eaglenest B&B. Thank you very much! If you would like to book us for a house concert or show, or for outstanding background music for your venue, please contact us at chris@many-strings.com.Thank you very much. Please enjoy samples of our performances in the Video section of this site. The Video section also includes our music videos, including "La Mer", "Natural Harmony", and "Borrego Evolutions." 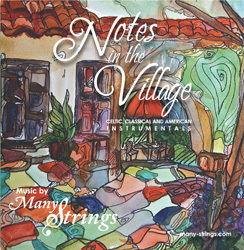 You can sample our new CD, Notes in the Village, in the "Our Music" section of this site.This beautiful CD was recorded in Logic Pro with a stereo Rode microphone. Chris has over thirty years of experience teaching San Diego, California, and American history through music, dance, and drama. He has led over 150 school assemblies focused on teaching children and adults historical music through vocal and instrument participation. He has taught classes for teachers at UCSD and SDSU. Please see the Music Ed. tab. for updated information related to his upcoming classes. View our music section for more samples.